Alex McDonnell ws on the scoresheet for City of Derry at Ballina on Saturday. Following game No. 10 of what has been a very challenging season, City of Derry remain eighth in AIL Division 2C with just 13 points to show for their efforts. Thomond sit just one point behind the locals in the play-off position though Derry are just two points behind Tullamore in seventh following Saturday’s defeat to leaders, Ballina. That was defeat No. 7 in a game no one expected Paul O’Kane’s men to take anything but they can take confidence as for long periods in Hefferon Park, Derry were the better side. Derry’s main issue is converting pressure into points. The scrum was again untouchable. Four consecutive scrums yielded four penalties which forced Ballina to make changes to their front row. However dominant Derry were, it was not rewarded sufficiently by the referee. With penalties racking up against Ballina, the referee spoke to the home side on more than one occasion for infringements but Derry can be rightly frustrated about the number of misdemeanours that went unpunished.. 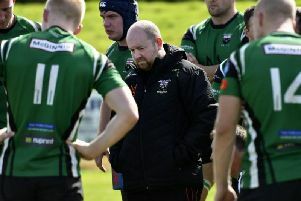 The game did however pivot on a yellow card midway through the second half when the touch judge’s intervention resulted in David Ferguson being shown yellow. In perfect conditions, Derry started brightly but a wayward kick from hand gifted Ballina full-back the space to show his blistering pace. Poor first up tacking enabled Ballina to get good field position and with quick recycled ball, the cross-field kick fell into the arms of Ballina winger to score a very easy opening try. Derry responded well and quickly found themselves inches from the try line but were unable to press home their advantage, mainly down to one up runners trying to smash through two or three defenders. The visitors were rewarded on 26 minutes when Ballina were caught offside and Alex Mc Donnell slotted over the three points but that cancelled out by a Ballina penalty for 8-3. The second half began with frustrating fashion for Derry who were caught napping. One clean line break and Ballina were over for their second try, which was converted. However, Derry dug in and took the game to Ballina but the home side were beginning to assert themselves on the game. On 57 minutes the game was interrupted by the touch judge whose intervention resulted in Ferguson’s yellow card for foul play. Derry were then forced to make changes, Chris Lamberton exiting to allow Ross Harkin in to hook. With the visitors readjusting, Ballina turned up the heat and got in behind, off-loaded and try number three followed with a conversion to leave it 20-3 after 64 minutes. 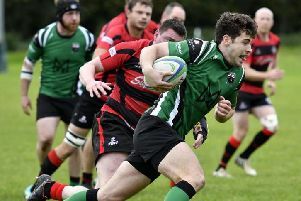 Recent capture Rory Maginty came on to make his AIL debut but it was all Ballina and, with their tails up, the home side managed to breech a weak Derry midfield to score try number four and 27-3. With 10 minutes left, Ballina were eventually reduced to 14 men just as Derry returned to their full complement. Quick thinking got McDonnell the space to glide in under the post and with the try converted, it was back to 27-10. Derry went on the offensive but some very poor ball retention in the urgency to get something from the game gifted Ballina possession twice, allowing them to make Derry’s nightmare second half complete with two very late tries. Second place Middleton visit the Craig Thompson Stadium at Judges Road next week with Derry facing a rejuvenated Thomond on February 16th in Limerick.